We have all been through it. The horror of listening to a 145-slide presentation, stuck on full screen, with literally no indication when the last slide will come. You ask yourself, “Is there no light to the end of the tunnel?” Most likely, not anytime soon. But most often, it is not the presentation that is off-key, but the presenter. Show Emotion: Show some spark when you present. Tell a story. Show that fire! Are you not on screen trying to prove something you believe is valuable to the audience? They are already giving you the most irreplaceable thing you can get from them—their time. Do not abuse that privilege. People are more likely to make decisions on emotion rather than logic anyway, so it is best to get them to be emotionally connected with whatever you are pitching. Next time, keep your audience in mind and be kind to them. They are most likely more receptive at the beginning of a presentation when you catch their attention with an emotional story, rather than with a product. Engage the Audience: Engage the audience, ask questions, get them involved in the presentation, itself, and always keep good eye contact. If you are going to be up there for half an hour, share a little spotlight with someone else. Encourage the participants with your warm personality, and you will have won over the crowd. 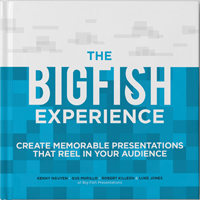 You can even ask your audience, “Have you ever seen a boring presentation? And did you ever think you were going to make it out alive?” Most likely, everyone will raise their hands, and now you have just captured an audience’s attention by relating similar experiences. Your foot is in the door, and make sure you do not lose it. They are on your side now. Know Your Audience: Is the audience here to listen to a serious matter? And you seriously just cracked a joke? You might have potentially blown your pitch. Key things to consider are: Who is your audience? What are they here for? Unless you are a stand-up comedian, your comedy routine might not be at the top of the list. Humor is fine, but if it is a serious matter, such as personal finances, do not go overboard. Research is the key in this situation on finding out what is the best approach to your target audience. Have a Flow: Does the audience know what you are driving at? Making your presentation flow smoothly from a beginning to an end not only makes your presentation easier to write, but also might help ease your audience’s tension by letting them know that this is a presentation with a solid beginning and end. Whether it is on note cards, paper, or in your head, the flow should all be the same. Scripting your presentation provides an easier way for you not to miss a beat, and a better way for your audience to understand you without asking questions that you should have already answered. Have Fun: No matter what the topic, have fun with your audience. Add humor. Tell a joke at the beginning to break the ice. Do not be a “stiff” up there on the stage. Not only will you be uncomfortable, so too will your audience. In Greek tragedy, an audience should always feel a bond between themselves and the actors. This bond is called catharsis—and it is the emotional response that drives us to reading and watching plays over and over again. Tragedies, too, can be fun experiences. Having fun brings an audience together—they have connected with you. And if they associate themselves with you, you have already sold them on the pitch. Whatever the case, have fun. So now you know about some of the little things that can take your presentation to the next level. Just remember: you need to practice. Eventually your practice becomes a habit, and you will grab the audience in no time. Now get up there and present like a rock star!